‘Tis the season to be merry, to invite loved ones over and celebrate around the hearth. While you’re decorating your home this holiday season, share your choicest inspirations with us for the Holiday Home Decor Contest! 2. Create a new board on your Pinterest profile and Pin decor pictures from anywhere across the web to create your dream Holiday Home moodboard. Include at least 5 home products from www.jaypore.com. 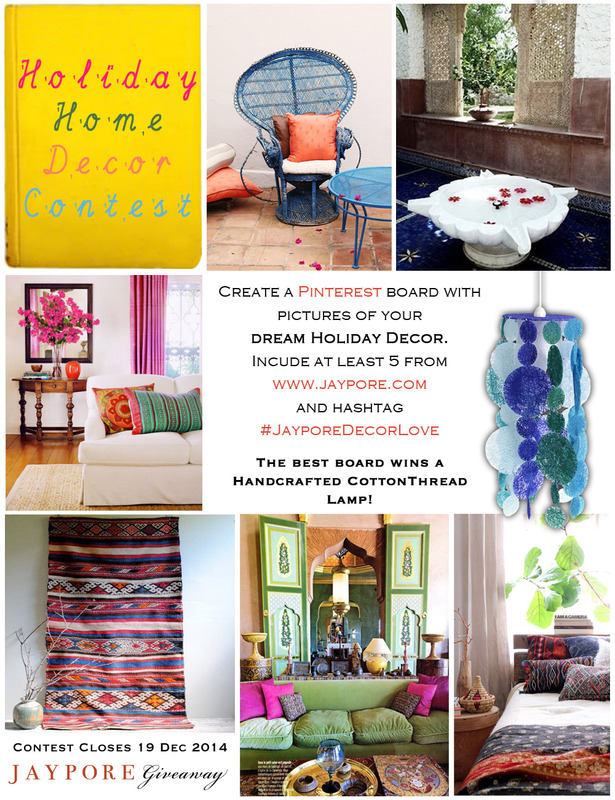 The best board wins a handcrafted cotton thread lamp! Posted in Contest, Decor, DIY, Homes, inspiration, Jaypore, Tips and tagged Contest, decor, diy, giveaway, Holiday, home, inspiration, Pinterest. Bookmark the permalink. Is it required to put the hashtag on every pin in the board? Yes Aishwarya it is. That’s the way for us to track all your pins easily. Happy Pinning!